Silver-Plated Love of Life Pendant Heart Necklace - Just $3.99! The Silver-Plated Love of Life Pendant Heart Necklace is currently selling for just $3.99 on Amazon.com! 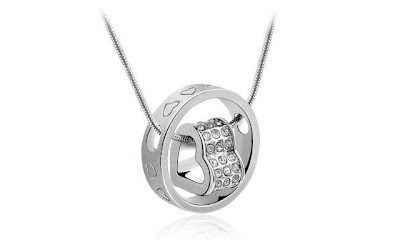 You will be saving 87% off the listed price of $29.99 with this jewelry deal. Read the customer reviews for this heart necklace. This item is eligible for Free Shipping with a qualified $25 purchase or an Amazon Prime membership. The prices on Amazon change frequently, so do not wait too long to take advantage of this discounted price. See all the Fashion For Less deals I've shared for more discounted clothing, handbags, shoes, accessories, and jewelry.